Spokane's nationally award winning Civic Theatre presents "Nunsense" opening this Friday, Feb. 18th and running through March 6. Starring are Jean Hardie, Kathy Doyle Lipe, Abbey Crawford, Patricia Brady and Jillian Wylie. Channeling their fundraising know-how, The Little Sisters of Hoboken put on an unforgettable variety show. Featuring the songs: "Growing Up Catholic," "I Could've Gone to Nashville," and "Holier Than Thou." If you attend Spokane Aids Network's 13th Annual Oscar Night Gala Sunday, Feb. 27 at Northern Quest Resort and Casino, you'll have such a great time you'll want to thank the Academy too. There are still some good seats left for this fantastic fund raiser. Besides beautiful people, an incredible venue, the Oscars, fabulous dinner and silent auction full of great values, there's satisfaction knowing you're helping an important local organization, The Spokane Aids Network. The doors open at 4:30 p.m., Oscar telecast starts at 5 pm on KXLY 4. Dinner at 6 pm. Tickets are $125. 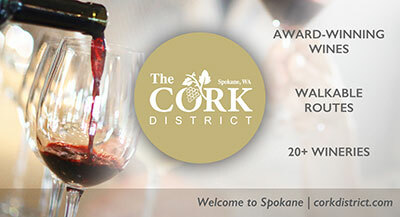 Go to www.san-nw.org/events/oscar_night_gala.asp to reserve your spot at Spokane's most glamorous event. Can't wait to hit the links? Here's the next best thing. The 13th Annual Spokane Golf & Travel Show is this weekend, Saturday, Feb 19 and Sunday Feb. 20 in the Spokane Convention Center. NEW event/show hours are Saturday 9 - 5 pm and Sunday 10 - 4 pm. Admission is $12, children twelve and under are free. Tickets available www.SpokaneGolfShow.com or all Ticketswest Outlets. Every adult paid admission will receive a two free rounds of golf, one free round of golf from Spokane's Fairways Golf Course and another round from a variety of courses including; Priest Lake, Columbia Point, Kokanee Springs, Prairie Falls, Stoneridge, Bryden Canyon, Redstone, Cascade, Dominion Meadows and Christina Lakes. Kids under 12 receive a free golf club from the PGA Clubs for Kids Program while supplies last (first 1,000). For more details go to www.spokanegolfshow.com or call 509-621-0125. LOVE that poetry, for free. The Zone 4 Poetry Reading Series continues with special LOVE Poetry Reading Sunday, Feb. 27th at the John F. Thamm Gallery 11 S. Washington (downtown Spokane Hutton Bldg). The reading is 3-5pm and admission is free. 3:00-3:30 is open mic with a featured love poem reading by Pava Young with guest reader, Tom Patterson from 3:30-4:30. For further info call: 509-868-7434. Christian Youth Theater presents an affectionate paean to Smalltown, U.S.A. of a bygone era, Meredith Willson's "The Music Man" follows fast-talking traveling salesman Harold Hill as he cons the people of River City, Iowa into buying instruments and uniforms for a boys' band he vows to organize - this despite the fact he doesn't know a trombone from a treble clef. His plans to skip town with the cash are foiled when he falls for Marian the librarian, who transforms him into a respectable citizen by curtain's fall. Performances are Friday, Feb 25th - 7:00pm, Saturday, Feb 26th - 3:00pm, 7:00pm, Tuesday, Mar 1st - 10:00am, 12:30pm, Wednesday, Mar 2nd - 10:00am, 12:30pm, Friday, Mar 4th - 7:00pm, Saturday, Mar 5th - 3:00pm, 7:00pm and Sunday, Mar 6th - 3:00pm. PRICES: $11 - Individual Online, $14 - At-the-Door Price $9 - Group Discount (10 ticket minimum) $10 - Child Discount (Age Limit: 12) $10 - Senior Discount (Age Minimum: 65). Call 509-487-6540 for Tickets. Martin Short brings his comedy to Northern Quest Resort and Casino Sunday, Mar. 6 for a 2 pm performance. The Canadian-American comedian, actor, writer, singer and producer is best known for his hilarious work in TV and film. He has appeared on SCTV and Saturday Night Live and in many popular comedic films including Three Amigos, Innerspace, Pure Luck, Jungle 2 Jungle, Mars Attacks, Father of the Bride and Father of the Bride Part 2. Tickets are $50 on the floor, $60 in the grandstand. Contact Ticketswest www.ticketswest.com or 800-325-SEAT. Kari Marguerite CD Release - Spokane jazz-soul-pop singer Kari Marguerite is unveiling her anticipated new album at a CD release soiree with help from funky blues band Jesi B and the All Rites and a special acoustic engagement with "hip-hop-meets-jazz" band Flying Spiders at 8 p.m. on Saturday, February 19, at The A Club, 406 1/2 W. Sprague. Cost: $8 at the door or through karimarguerite.com. Flying Spiders - Organic hip-hop project Flying Spiders closes out its February residency as the house band at the Platform Presents: New Taste Tuesday variety show at 9 p.m. on Tuesday, February 22, at Zola, 22 W. Main St. Cost: Free. Baroque Network - Local graphic artist, designer and visionary Matt Bogue is hosting a Moulin Rouge-themed affair with artists, musicians, fashion enthusiasts and entrepreneurs, featuring a fashion show, dance music provided by DJ Likes Girls and a live performance by Terrible Buttons starting at 5 p.m. on Thursday, February 17, at The A Club, 406 1/2 W. Sprague Ave. Cost: Free. The Hop - The Hop, aka The Cretin Hop, re-opens with a certifiable bang, and a fleet of punk-rock and metal bands, including Reason For Existence, Mecha Shiva, Freedom 35, and Dracula, starting at 6 p.m. Friday, February 18 at The Hop, 706 N. Monroe St. Cost: $5. Hey! is for Horses - John Blakesley's folk rock band Hey! is for Horses heads up a show with Smile Brigade and Emma Hill at 10 p.m. on Saturday, February 19, at Mootsy's, 406 W. Sprague Ave. Cost: $5. For local music news, events, mp3s, artist profiles, multimedia and more, visit thesomshow.com. Andrew Ouellette has been working on developing his stand up act for a few years now. He started going to open mic at the old Brick wall comedy club. When he came to Don Parkins at Uncle D's Comedy Underground, he developed a very funny, defined direction in his comedy. He is a bit rough, a raging and opinionated comedian who comes from a very unique perspective in his comedy. Andrew has a similar style to Sam Kinnison, without the foul language. Parkins promotes comedy at his club that may be blue in material content - but not language. Andrew has been working professionally for over a year and is doing very well. He is an up and coming comic who, in a few years, will be a fantastic headliner who will be able to perform in a corporate setting as well as a bad biker bar. Andrew Oullette appears regularly on stage at Uncle D's Comedy Underground at Bluz at the Bend, 2721 N. Market at Illinois. Thursdays at 8 are open mic nights; shows are Fridays and Saturdays at 8. This Friday, Feb 18 and Saturday, Feb 19 at 8pm, Uncle D's presents comedian Joe Vespaziani. $10 cover Friday, $12 cover Saturday. The website is bluznews.com. Children's Miracle Network Hospitals and IHOP restaurants will celebrate National Pancake Day on Tuesday, March 1 from 7 am to 10 pm. IHOP will be offering a free short stack of its famous buttermilk pancakes to each guest and in return, diners will be asked to leave a little something behind for Providence Holy Family Hospital; Providence Mt. Carmel Hospital; Providence Sacred Heart Children's Hospital; Providence St. Joseph's Hospital; St. Luke's Rehabilitation Institute; Kootenai Medical Center; Inland Northwest Health Services. IHOP served four million free pancakes on National Pancake Day 2010 and pancake lovers donated more than $2.1 million to children's charities, far exceeding the fundraising goal. All of the free pancakes served on National Pancake Day 2010 would have created a stack more than 31.5 miles high. It was the largest one day event in IHOP's 52 year history. The Gonzaga Symphony Orchestra will present its winter concert at 7:30 p.m., Monday, Feb. 28 at the Martin Woldson Theater at the Fox (1001 W. Sprague Ave). Conducted by Kevin Hekmatpanah, the performance will feature internationally acclaimed and prize-winning pianist Awadagin Pratt. "Dating you is like dating a Stairmaster." Name the movie that line appeared in and win four tickets to this weekend's Golf and Travel Show at the Spokane Convention Center. Send your best guess and your phone number to info@entertainmentspokane.com. The winner will be selected at random from correct entries and will be announced in next week's e-newsletter. 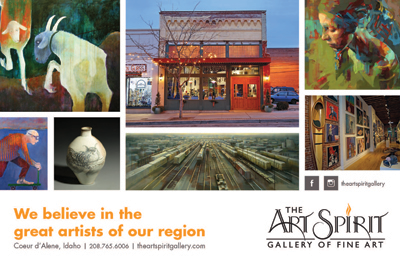 The deadline for entries is noon on Friday Feb. 18. Last Week's Winner: Swanee skillfully remembered that movie line. Last week's movie quote was, "Apparently she has certain skills - acquired at an establishment in Shanghai." Swanee correctly guessed that it was from the movie "The King's Speech" and won a $10 gift certificate from Ben and Jerry's Scoop Shop on the 3rd floor of River Park Square.